Earlier this month I was asked to be a part of the #FiorelliHandpicked Campaign. Having just launched their new AW13 collection, Fiorelli decided to celebrate by matching their five key styles of the season with five of their favourite bloggers. I was super stoked to be chosen! It's fairly obvious that I have a thing for handbags. I just can't resist them. So when I was sent the brand spanking new Fiorelli Brooke bag I was pretty darn excited. 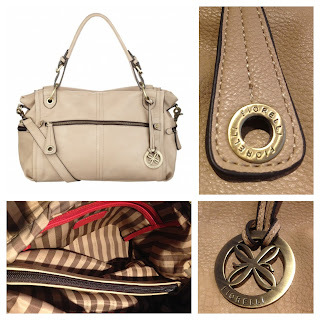 Fiorelli couldn't have made a more perfect match! Fiorelli are the UK's number one manufacturer of handbags and it's easy to see why. Every single bag that they create is designed to be beautiful and stylish - but also useable. Even better is that they are all affordable. Fiorelli don't believe a beautiful handbag has to cost hundreds of pounds - and the proof is in the pudding! The Brooke is a super-soft shoulder bag which is available in three colours; biscuit, tan and black (I've got the biscuit one). 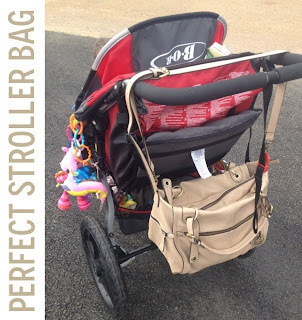 It has two large grab handles and a detachable shoulder strap with a buckle fastener that enables you to adjust the length (meaning it can be worn across the body or hung over pram handlebars if you'd rather not have it on your shoulder or arm). It has four zipped exterior pockets which are great for things you need to access easily, and also has very stylish brass fittings and a Fiorelli decorative charm. Inside, the Brooke is lined with a branded Fiorelli striped material and has hundreds of different compartments (something I am very fond of when it comes to handbags - I like to keep things organised!) The bag is divided into three large compartments, the middle of which is zipped, and there are three further sections too - a phone pocket, and slip pocket and a smaller zippable one. It's a great size - H27 x W33 x D22 cm - and super flexible. 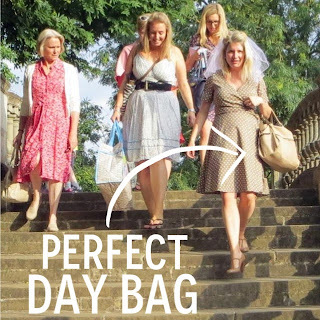 It can be used during the day as well as in the evening; for work, nights out, mini breaks (if you pack light!) plus it's great for carrying mama + baby paraphernalia (let's face it, I rarely go out without wipes and nappies these days!). This style is 'smart but casual' and, quite simply, it is divine. 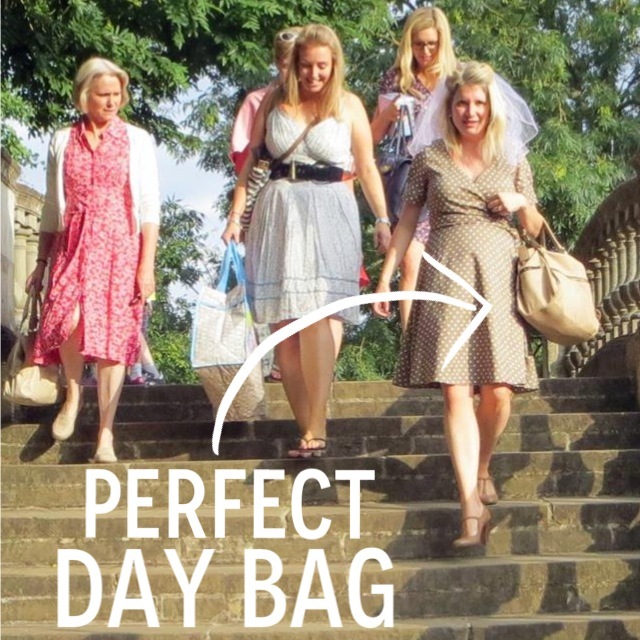 PERFECT for women on the go, and very reasonably priced at just £65.00 (available here). My Brooke has been on my shoulder / pram constantly since it arrived last week. It has accompanied me on my Hen Do, been taken bridesmaid dress shopping (and then on for celebratory cocktails! ), taken a trip on the tube to Stratford for the LolliBop festival and been a part of general every day errands too. It was a fab handbag for my Hen Do as it was large enough to carry my make up bag and change of clothes for the evening, whilst still looking very smart and compact - and matching my polka dot Bonprix tea dress perfectly. As a day bag, it can also fit an iPad / netbook in it no bother so would be perfect as a handbag for work. Similarly, it fits across my BOB Revolution SE's handlebars perfectly and makes a brilliant - and VERY stylish changing bag - with more than enough compartments to keep mine and my daughters' bits and pieces entirely separate. When we went to London for the day for LolliBop, we loaded it up with two drinks, four nappies, a packet of wipes, 2x bibs, 2x muslins, 2x bananas, 2x packets of mini cheddars and a few dummies - as well as my purse, phone, charger, keys and a couple of bits of make up. The zipper closed easily and the bag didn't bulge - proof of just how spacious it is. I was sent a Fiorelli Brooke bag in exchange for this post as part of the #FiorelliHandpicked Campaign.